"Me and God, we'd be mates!" More so than Koala Bears, kangaroos, or even Foster's Beer the most widely known export from Australia is a Crocodile, Crocodile Dundee to be exact. Released with little fanfare in 1986, Crocodile Dundee went on to become the year's biggest hit. Aside from grossing over $150 million, it also turned a then unknown Paul Hogan into an overnight sensation. Though as is most often the case, too much of a good thing can be bad as the sequels spawned by the first picture have failed to reach the success of the original, in terms of critical and audience reaction. Newsday journalist Sue Charlton (Kozlowski) is having a nice time in Australia. Before she leaves though she is determined to find Michael J. 'Crocodile' Dundee (Hogan), a legend in the outback thanks to his ways with crocodiles. The hero of local legend, it is said that Dundee escaped after having half his leg bitten off in an attack by a crocodile, which he later killed. As Dundee leads Sue on a tour of the outback where his encounter took place, the two eventually develop a chemistry that culminates in Sue's persuading of Dundee to come to New York with her. Once in the concrete jungle, Dundee is out of place amidst the hurried atmosphere on the New York Streets. As he deals with his new surrounding his love for Sue deepens, if only she weren't involved with her editor Richard (Blum). It is in the moments featuring Dundee in New York that the film works at its best. From the now classic exchange with a pair of muggers to his bewilderment at the thought of a bidet, Dundee's fish out of water situations help give the picture energy. Yet for all of the wonderful scenarios it is hard escaping the fact that Crocodile Dundee fails to bring any sort of conflict to the table. The script (co-written by Hogan) seems to meander from one situation to the other without providing a structural backbone. In other films the role of Sue's American boyfriend would have been better developed as a devious snake that the audience cheers at his demise. This never happens as Blum's role is poorly scripted so that the audience fails to care what happens to him. 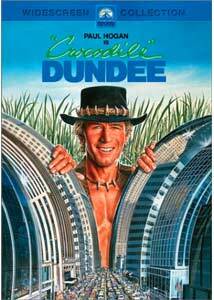 Aside from those small problems, Crocodile Dundee never fails to delight. This is in large part due to Paul Hogan's wonderful performance. With his rugged, tan, and weathered looks he crafts his performances as Michael Dundee with terrific timing and comedic sensibilities. Kozlowski (who would later marry Hogan) is fine as Sue, though her she is often set aside in favor of Hogan. Perhaps the greatest reason as to why Crocodile Dundee swept its way into pop culture is its indisputable charm and whimsical feel. It is the type of film Hollywood fails to produce more often, it is family friendly and offers little more than joyful entertainment. It is one of a small handful of films that appeals to both old and young. Image Transfer Review: While viewing the 2.35:1 anamorphic widescreen transfer for Crocodile Dundee I had a hard time believing that the picture is fifteen years old. This isn't an eye-popping transfer, but it looks very good. Colors are vibrant in scenes taking place in the outback while the grays and blues of New York look fine also. Black levels are fine with good detail, and there is little grain evident throughout. Edge enhancement and pixelation look fine, though what is most surprising is the lack of and scratches or print flaws. This is a great transfer from Paramount. Audio Transfer Review: While it is obvious that great lengths were reached to create a terrific video transfer, the same can't be said for the audio. Only a Dolby 2-channel mix is provided and while it doesn't sound bad, it could be better. Ambient sounds are present in the rear speakers at both the start of the film as well as in the New York scenes. Dialogue sounds fine, though there are several isolated moments where it seems as though the center channel seems to be mixed at a lower volume than other speakers are. Extras Review: The film's theatrical trailer is offered. Though Paramount's new DVD is lacking in the special features department (this films gets only the trailer while Part III gets even more?) the disc still boasts nice audio and video portions. It is a nice film that I am happy to have on DVD, and it is indeed a g'day (sorry, couldn't resist) with it in my player.